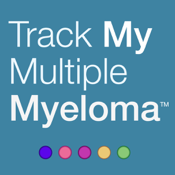 Track My Multiple Myeloma™ is designed to help you more easily keep important information about your multiple myeloma all in one place. You’ll be able to keep track of appointments, log test results, store key contact information, track how you are feeling, and share this information with your family and healthcare team with the tap of a button. You can also set reminders to ensure that you take your medicines as directed by your healthcare team and refill prescriptions on time. Printable reports help keep your caregivers and healthcare providers updated. As a reminder, only you and your doctor can determine what treatment is right for you. This app does not replace any medical advice provided by your healthcare provider. It is important that you discuss your treatment, treatment results, and all side effects with your healthcare provider. This application is brought to you by Celgene and is intended for use by multiple myeloma patients and their caregivers and healthcare team. Celgene does not collect any personal information and does not track your use of this app. The design of this app is owned by Celgene Corporation and is subject to copyright protection. © Celgene Corporation. All rights reserved.